Where has all the commuters' chocolate gone? 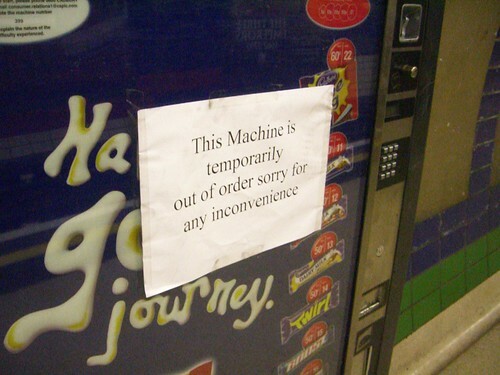 Like many people who use the Tube every day you might have been wondering why for the last few weeks most of the Cadbury's chocolate dispensers on the London Underground have been out of order. Martin Deutsch not only wondered but decided to email London Underground to find out why. He forwarded me on their response which had a massive disclaimer at the bottom saying that it shouldn't be reproduced in any shape or form whatsoever on pain of death, blah, blah, blah. But basically the gist of it was that they have been turned off for safety reasons while they were being checked out. I wondered just how unsafe a chocolate dispenser could be, and had visions of the machines shooting out molten hot bars of Whole Nut or Caramel bars so that your hands were burnt when you picked them up. Or that they should have had those warnings like you get on McDonalds Apple pies or cups of coffee - Warning these contents are hot. Fortunately the guys over at the tubechallenge forum had been debating the subject and it's not ALL chocolate machines as I had originally thought, but those on "section 12" which have underground platforms. According to an anonymous commenter on "On the District's blog" - "smoke was pouring out of the one at Oxford Circus a few weeks ago so LUL have had them all isolated if they are on a section 12 (underground) station." So in a nutshell it looks like some of the machines have been overheating, which is obviously a potential fire hazard. How the fire is any less worrying if it's on an above-ground station is beyond me, but perhaps London Underground felt that overground commuters' need for choclate was greater and outweighed the fire risk!